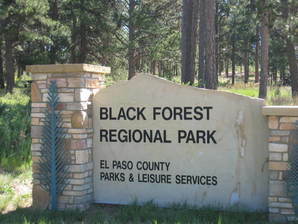 The Black Forest Trails Association is a local community non-profit organization with the following goal: To create a safe, legitimate, non-motorized, multi-use recreational trail system that connects Black Forest neighborhoods to each other and the El Paso County Regional Trail System. The BFTA organization works with local residents and various government agencies to ensure Black Forest area public trails are kept in good shape, new trails are included in new development plans, works with local residents to create connecting paths between our many beautiful parks and trails systems, plus much more to help keep your Black Forest area parks and trails open and pleasurable for your use. BFTA holds regular public meetings and always welcomes input from members and the Black Forest community on how you want your parks and trails to be used and developed. We promote trails use for all types of activities – hiking, biking, horseback riding, snow showing, educational activities and more. Please consider joining the BFTA organization to help ensure this community continues to maintain and develop the great parks and trails system we enjoy so much. Become A BFTA Member Now!